What’s next in Suniva/Solar World Trade Petition Case? With yesterday’s U.S. International Trade Commission’s unanimous vote that there has been significant injury to Suniva and Solar World from low-cost solar panels imported from other countries, the manufacturing companies’ trade petition case moves to the next phase: The four members of the USITC will hold a “remedy hearing” on October 3rd during which alternative recommendations will be heard. By November 13th, the USITC will send its formal recommendation to President Trump, who will have until January 12th to make a final decision on whether to accept, reject or reform the USITC’s recommended solution. The 4-0 decision allows the imposition of tariffs or other trade remedies on cell and module imports on a global basis, however separate determinations were made for countries with specific trade agreements. USITC found injury from imports from Mexico and Korea, but not Canada or Singapore, meaning that it will not recommend trade remedies against cells or modules from Canada or Singapore. Additionally, the agency found no significant injury caused by imports from Australia, Colombia, Jordan, Panama, Peru and Central American nations, and these are likely to be exempt from proposed trade remedies; however none of these nations possess significant cell or module manufacturing capacities. 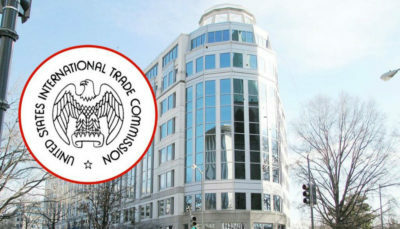 The commission is recommending that President Donald Trump exclude from the tariffs Canada, Singapore and several other U.S. free-trade partners, which combined supply about 5 percent of solar panel imports. The commission, however, voted to recommend that tariffs or quotas be applied to the two biggest solar panel manufactures among U.S. free-trade partners: South Korea and Mexico, which combined supplied 28 percent of panels imported into the U.S. last year, according to the commission. 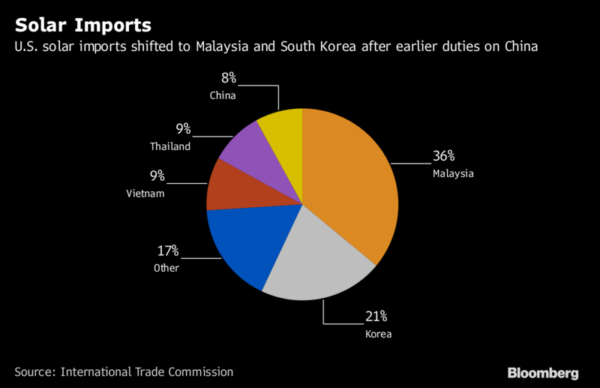 The majority of imported panels come from Malaysia, Vietnam and other Asian nations not covered by free-trade deals. Obama’s tariffs on China. Click to enlarge it. “To minimize these job losses and prevent a significant spike in solar installation costs, we hope that any financial penalties recommended by the ITC will be small, if any, and that the President will not implement any tariffs that would stifle this American industrial success story.” – TJ Kanczuzewski, president and CEO of Indiana-based Inovateus Solar. Read more solar installers’ statements by clicking the article link, above. An E&E News investigation uncovered the majority of Suniva’s products were not made in the U.S., but came from other countries. The company sold a 64% stake to Chinese firm Shunfeng in 2015. SolarWorld’s parent company is based in Germany as well, which filed for insolvency in May. Suniva declared Chapter 11 bankruptcy in April. This entry was posted in Nebraska / Midwest News, NewsBlog and tagged Suniva/Solar World Trade Petition Case, U.S. International Trade Commission on September 23, 2017 by Helen Deffenbacher.